In the field of market systems development, which is one of the main areas of my work, it is ‘good practice’ to do a root cause analysis pretty early on in a project. It is usually done after selecting and analysing a market sector to figure out why it is underperforming and/or excluding a certain part of the population. The logic is simple: we want to go beyond tackling mere symptoms (e.g. poor people being excluded, women being not able to earn money, youth not getting jobs) and discover the ‘deeper’ reasons for these patterns – the root causes. The method used to find a root cause is for a particular symptom to keep asking ‘why does this happen?’ until one hits some sort of a bottom (why do youth have no jobs? because there is a mismatch of available skills and labour demand. why is there a mismatch of available skills and labour demand? … and so on, you get the point). Once this root cause is found (I haven’t really figured out when to stop with the why’s), you design some interventions to ‘fix’ it, expecting that once it is fixed, also the symptom will disappear. There is of course an underlying structure that shapes the emergent patterns. In the social sciences these structures are often called institutions – the ‘rules of the game’, norms and arrangements that shape how we engage with each other. In complexity thinking, we say that these structures give the system a certain disposition to show certain behaviours rather than others. These institutions are not designed but evolve over long periods of time. Also, a large number of these institutions interact with and shape each other and the way they shape behavioural patterns. Hence, there cannot be a root cause on the level of these structures that can be fixed, either. Again, the idea of many little things interacting with each other to establish structure and behavioural patterns through continuous learning and adjusting to each other. No single, one-dimensional logical cause-and-effect chains from a root cause to a symptom. The concept/neology of symmathesy, mentioned by Ward and developed by Nora Bateson tries to capture this idea. In the same way, institutions and behavioural patterns ‘grow’ in a context and continuously shape and are shaped by a society and culture. What different way of thinking could we use instead? Imagine that you have a round flat table and around that table are a series of electro-magnets. They can vary in strength and also polarity. Some you control, some are controlled by people you know and some appear to change at random. In the middle of the table are a lot of iron filings. Now as long as the magnets don’t change, the iron filings will form a complex stable pattern. However as the magnets fluctuate in strength the pattern changes. if some of them change polarity then change is sudden and drastic before a new stability emerges. At the same time some of the iron filings get magnetised in turn as they pass through electric currents, making the situation even more complex. I may not even be aware of some modulators until they suddenly come into play and their impact is seen. The magnets in this case modulate the system. They interact with each other and with the system as a whole, they make it inherently unpredictable. Understanding what modulators are in play will help us understand emergent behaviour of the system, but not to predict its future state. Attributing cause to a limited number of dominant modulators (that is what I think people mean by drivers) is a mistake as the level of interaction is too much. … The whole driver mindset is seeking to find something to which we can allocate causality. However it’s not like that, so tempting as it is its dangerous. What does this mean in practice? While it does not make sense to go on the search for root causes, we can still identify modulators that we believe influence the situation and lead to the unfavourable patterns we observe. We cannot influences all modulators and some we might not even be aware of. But we can interact with some of them. The concept of modulators ties in with other concepts from complexity thinking. For example, constraints and attractors are types of modulators. To give an example, an enabling constraint like the ability of traders to build trust and work together in a value chain modulates the way the economy performs. An attractor like a dominant crop that is produced in a region does as well. Other modulators are for example institutional structures, educational practices, beliefs and values, etc. The point here really is that unfavourable patterns of behaviour in complex systems are not caused by specific root causes that can be fixed. There might be a modulator with a strong influence on the pattern, which we can identify and change. But given the complexity of the system, the exact outcome of the is change, i.e. how the unfavourable patterns shifts, cannot be predicted, because many other modulators are at play as well. The Mental Habits of Effective Leaders: My Interview with Jennifer Garvey Berger. The Knowledge Project Ep. #43. – Highly recommended! Aidan Ward. Where will change go? Nora Bateson. Symmathesy: A Word in Progress. Dave Snowden. Drivers and modulators. Glenda Eoyang’s CDE approach could be added here as a way to identify the modulators of a pattern that then allow us to change the CDEs to see if they shift/modulate the pattern towards more of what ‘we’ want to see. Thanks Bhav. I’m aware of her work but haven’t been able to dive into it. Alone standing root causes might actually be an illusion, however, a bunch of underlying causes could combined represent a “root cause”. Following that chain of thinking, it becomes necessary to find that bunch of underlying causes that are mainly responsible for the problem or symptom. An example: a symptom we would like to address might be “low productivity” in a certain crop. After the market system diagnostics and root cause analysis we might end up with several possible deep underlying or root causes: a) no training offers for farmers because training institutions are mainly operating in urban areas and are considering rural areas as non-profitable clients, b) minifundium is driving young people into the cities; minifundium cannot be stopped due to rigid cultural norms, c) xxxx, etc. For each symptom/problem we might identify a bunch of such deep underlying causes. Together they are mainly responsible for the problem/symptom to persist. In practice we prioritize the most influential deep underlying causes and try to formulate potentially successful interventions. However, here the tricky part, in order to be able to formulate such an intervention we must think about: who can help us to implement that intervention? What is the best way how to do it? These two questions lead us directly to the most relevant drivers/modulators. If my thinking is right, than it would be just a semantic issue after all: root cause vs. deep underlying causes vs. a combination of most influential underlying causes, etc. However, to arrive at the most influential drivers and modulations there might be no other way than through these underlying causes. Hi Sven. Great thinking. Yes, what you are describing is essentially an attempt to find some modulators that shape the situation of crop production in your country. Some other ones might be hidden and out of your side, some might be hard for you to influence, like the political economy. You don’t know how exactly the system will react if you start to change some of the modulators, such as the minifundiums. Effects might be unexpected. That is why you need to run small, safe-to-fail experiments. Also, you can start describing what you call ‘deep underlying causes’ from an institutional perspective – what are the social norms, customs, beliefs, etc, that shape the patterns you see. I think you are on a good path. As long as you don’t say that there is a root cause for one symptom and then try to build a single logical chain from one intervention to the result, claiming that this particular intervention will lead to that result, than that is a good step forward for me. I totally agree Marcus. Regarding what you said “from an institutional perspective – what are the social norms, customs, beliefs, etc.” In practice, I see a lot of MSD practitioners that are not willing or able to go that deep into social analysis. The main reason might be that there are few sociologists, anthropologists etc. in MSD projects. In order to avoid such biases here in Bolivia we combined the MSD approach with the Multidimensional Poverty Approach (Oxford), breaking the latter down to community level. This excessive is a great experience for the whole team and widens the perspective enormously. In fact from the beginning in complexity in our field that has been the point- a complex market is one that has several root causes, not just one. If we follow through with an analysis, we start with the symptoms emerging from the market failure (low sales or no input supply) and then follow through in identifying what are the root causes. When you say “institutions are not designed but evolve over long periods of time. Also, a large number of these institutions interact with and shape each other and the way they shape behavioural patterns. Hence, there cannot be a root cause on the level of these structures that can be fixed, either.” you are right, the one root cause is not going to be found. Yet social norms or formal laws will probably be at least one root cause. Hi Mary. Thank you for your comment. It seems to me that there are different ways of understanding complex system. What you describe is a view on systems in which there are a number of root causes that in a summative way lead to a set of symptoms. So there is a beginning (the root causes) and an end (the symptoms). You say there are always several root causes at play. But essentially there is always a direction, a causality. One leading to the other. Cause and effect. And most of all, you say we can identify these cause and effect chains in market systems and fix the beginning (the root cause) so we get a different end (a pattern that is more favourable). In my experience, this view reflects how a majority of market systems practitioners see systems. And this view also underpins the operational guide(s) to market systems development. In my post I want to offer a different view on reality. I cannot say which one is better or more useful. That is up to you to decide for your work. Instead of thinking in causes and effects, I suggest to think in interconnections. Not in things where one leads to another, but in context, context rich with interaction and interrelation. Everything is connected in a complex system and there is a high level of multi-directional influence. Not one thing leads to another, but the way everything is arranged and interrelated leads to the context we see. And this context is dynamic, the direction of change shaped by mutual learning and adjustment. Modulators, in contrast, are patterns of interaction that shape the context in a specific way. For example, there are patterns that form attractors, a likelihood of a certain type of behaviour. These attractors have evolved over time and are the product of interactions, continuously shaped by interactions. They are not written down in a book that people go and read. People know how things are done in their context. Attractors are not in any person or objectifiable social norm. They are in the space in between. What does this mean for our work? To be honest: I am not sure. My thinking is still evolving. First of all it implies humbleness about what we can understand about a context, its history and its rich invisible spaces in-between – particularly if we are outside actors. It implies humbleness and the need to take great care when we intervening in a new context. Tread lightly, take small steps, continuously reflect on what is happening. The most important is to learn and adjust. Sense and make sense in order to act in the context. Do not try to take the context apart into puzzle pieces and then give value to them (root causes being more important than symptoms, etc.). Don’t try to objectify certain aspects of context and fix them. Focus on interrelations and the mutual learning that is happening in the system. This is how system trajectories are shaped and changed. Maybe this is what you call “woo woo” although I am not sure I understand the term – please apologise my ignorance. But this is where my current exploration and thinking takes me and I hope that this can add value to the practice of market systems development. This is a field of exploration and I am more than happy to – indeed I would prefer to – interact with all of you and see where this takes our common thinking and practice. One opportunity would be the upcoming Market Systems Symposium in April – registration is now open, I have registered already. Maybe I’ll suggest a session on “woo woo thinking” (https://www.marketsystemssymposium.org). I would say, we need to find practical ways to identify these interconnections, system dynamics and modulators. I see two possible scenarios: 1. the interconnections, etc. are more or less clear or obvious, and 2. They are not clear at all. What I mean is that very often we know the system so well that we can identify quite assertively these modulators without doing much analysis (e.g. one of our staff members has worked on that specific market failure for years). In other cases, the root causes might be obvious (e.g. fall of international prices, political turmoil, etc.). And, often we don’t have to look at the root causes at all because we just jump onto a great opportunity (e.g. supporting a new state investment programme). However, when we don’t have a clue about what is going on, then we will have to dig quite deep. When this becomes necessary we have to be very careful not to fall into the false belief that we have found the root causes and from there we just have to apply a certain cause-effect routine; as us might trick a rigid results chain into. In order to avoid that I don’t see another way as to sit together every 3 months or so (the field team, one or another expert and the management) and discuss in detail every intervention of the project. During these discussions changes in the system can be identified and build into the intervention strategy. I wont be able to participate in the symposium in Cape Town, but somebody from Swisscontact will be there. I hope you find a space to discuss these extremely important issues. Hi Sven. Thank for you pragmatic thoughts. I like the way you frame the different situations. The only caution I would put forward is that even in situations we think we know the effects of our interventions might be different to what we expect. The only think that is certain in complexity is that there are unintended consequences. 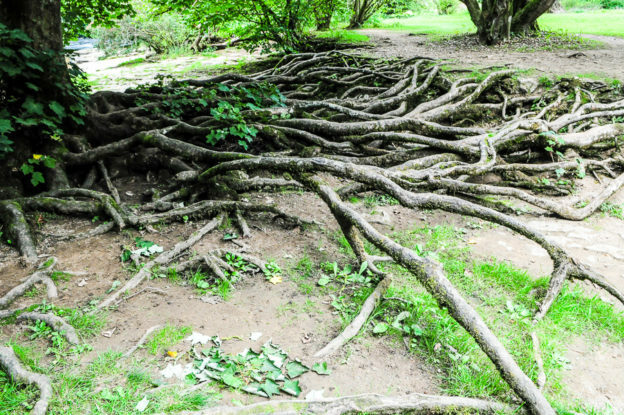 So even if we feel that we know the “root cause” to a problem, we should still tread lightly, take small steps, use probes to sense how the system reacts and keep our eyes, ears and all other sense open to perceive how the system evolves. If we like what we see, we can further amplify the pattern, if we don’t like it, we need to dampen it quickly. Being open and attentive allows us to spot weak signals that are easy to remedy. If we wait too long, we will inevitably see strong signals, which are much harder to remedy. Sven- in your first paragraph you present two scenarios: 1. the interconnections, etc. are more or less clear or obvious, and 2. They are not clear at all. Your scenario #1 would be a simple, complicated or complex. Scenario #2 is chaotic which then requires interventions and monitoring- to see what happens, and where the leverage points are. I do not agree with you that we don’t have to look at the root causes at all, we just jump on an opportunity. You will be bit in the bum at some point with that approach. And often in development that is exactly what we do- oh a new govt. program that we can partner with, let’s do it! But it does not address particular elements or address the contextual impediments turning market failure around to market development and market strengthening. Observing the market system for leverage points is where to start and then it is critical to continue with monitoring. Your thinking of cause and affects with root causes, seems no different than looking at interconnections that influence interactions. There are interconnections between no fertilizer-poor soil quality-poor yields-tropical storms washing soil away-no technology to adapt- no capacity building- no transport to and the list goes on and on. The interconnections influence interactions. Does one lead to the other- in some cases yes it does because the system is adapting to the factor/event’s impact on how the system works currently. In Market Systems we look for leverage points that will bring balance to the reinforcing feedback loop. In complex market systems I do not see how the root cause is the beginning and the symptom is the end. You are describing a simple system here to me. A complex market system has many moving parts that emerge from various events/factors, which i will call root causes, and there are many root causes that may be events or factors. When we are seeing more practitioners embracing symptoms and root causes in a very flat, assuming manner- even though we all have experience in the field with the market system we are developing, assuming is what gives us blind spots and we act in a reductionist Newtonian manner. Our observation is not systemic, it is looking at one part of the puzzle so to speak. I sense that you don’t like symptoms and root causes– and you see modulators as a way to get out of the root cause and affect paradigm, but where are your leverage points in modulators? I’d be curious as to how you propose to identify leverage points that can balance out reinforcing feedback loops; of which there would be various in a complex market system.